Recently, we, the students of international college of fashion, along with our faculty, went on an educational trip to Jaipur. Jaipur, also known as the pink city, is full of visitors’ attractions, including the famous Amer fort, Hawamahal, Jal Mahal etc. Jaipur also offers a wide range of learning opportunities for fashion students like us, including educational workshops on block printing techniques, anokhi museum of hand painting, handicraft markets, etc. Our trip was scheduled from 25th of March to 28th of March. On 26th we attended a workshop on a block printing technique called Dabu print, which involves use of a specially prepared mud mix with ingredients like babool tree gum, lime water and mud, etc. It is prepared in advance and is quick dried with the help of finely grated wood remains to speed up the process. All the students made their own products like stoles, scarves and dupattas through Dabu. A special feature of Dabu is that in the dyeing process, we only use natural dyes, no chemical dyes are used. Most widely found color is indigo, since it’s the most commonly found natural dye. In the workshop we had a hands-on experience of Dabu printing, which was an enriching learning experience as a fashion student. 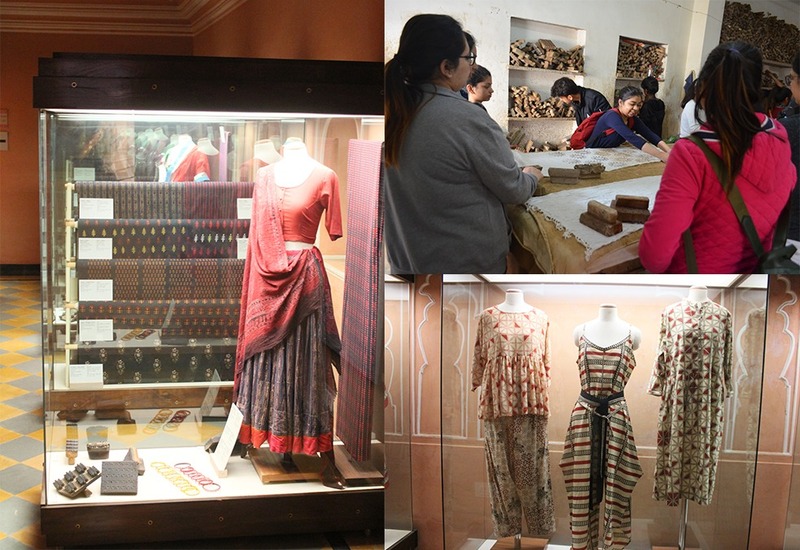 On 27th we visited the Anokhi museum of hand printing. The museum is home to the history of various forms of hand printing and block printing, including techniques like Bagru print and Sanganeri print. The museum has on display different examples of historic clothing of India and parts of now Pakistan, the reasoning of why people wore what they did, in what areas, what season, etc. All combined, this trip was full of new learnings, and we have now gained knowledge that is going to prove useful to us as students in the future. This trip to Jaipur opened new gates of opportunities and possibilities for us in the industry in future. It has been always said that designing is something which is related to arts and our Indian parents always assume it to be a cakewalk. Doesn’t it seem familiar to read? Well, this story is happening since forever no matter what our history says. It’s time to figure this out practically and wake people up to the real world and know how slippery it could be to walk over it. Designing is a very huge aspect in itself and contains a lot of knowledge to grab in mind. Its not only about sketching our thoughts over a paper; everything has to be correlated to make a story in itself which could be sold with a sense. But, what people think is that one should have hand skills to become a designer. What does the whole designing process contains? It’ a never ending process and have so much in it like a thought, an inspiration, skills to put your thoughts on paper, skill to express, skill to make the thoughts real, skill to visualize it with the techniques, the sense to the right colors, the right fabric, right forecast and tremendous presentation. And still it’s not done! The technical part what we are not aware of is how to sell it and how to expand it as a business to earn. So a designer has to keep in mind the technical factors such as how to reach the customers, how to get order and clients, what presentation, what budget, what rules and regulation domestically and internationally, what type of contracts, what terms and conditions, how to get more people in the business, how to promote, how to advertise, how to make profits. In this 21st century this isn’t now just a designing, it’s the whole business going on out there and to run the business you don’t have to be only active with your hand, anyway and in every way it requires mind and knowledge towards the business. To run the business and stick to it one should hold interest towards business, have knowledge of design, fabrics, business laws & strategies, be active towards forecast, possess good promotional skills, communication and dedication. What we should basically understand is that fashion industry has got work profiles in abundance and we can go for anything what we want not just only designing. Instead of designing there are many other profiles like merchandiser, blogger, vlogger, photographer, editor, stylist, journalist, motivator, speaker, entrepreneur and so on. As a personal opinion we all are the racers aiming towards the identity, profits and growth with our various fortes we have in us but we all belong to one field, one race and one direction in a stylish way. As compared to others, we are much better to express ourselves, to show up and moreover we are liberal and proud to be in the race where it’s written that we can actually find ourselves with our skills. The Fashion Industry has evolved significantly! Over the last 20 years, the industry has seen rapid growth, not only in terms of production, revenue and design but also in terms of the kind of career avenues that have opened up. Gone are the days when one could think of being in the Fashion Industry only as a Fashion Designer. 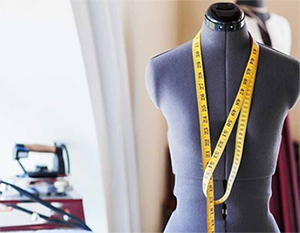 There are countless careers in and related to the Fashion Industry today and the roles are ever-evolving. It’s not just Glitz and Glamour, Fashion Industry is one of the most hard – working industries in the world. Living up to the constant demand and need of the changing times, it will keep you on your toes. If you have a creative mind and you come up with interesting ideas, this industry is a great place for you. Let’s look at some of the career options one can explore in the industry. 1. 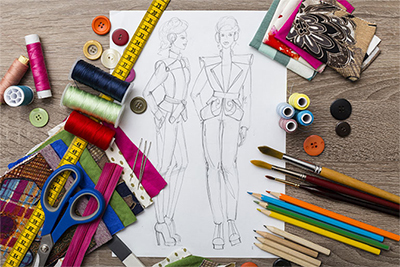 FASHION DESIGNER – Fashion Designing is an integral part of a Fashion House. Everything starts with a design. 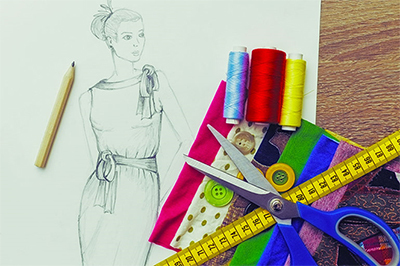 Being a Fashion Designer can be challenging but if you can live up to the constant changing dynamics of the Seasons then you should definitely explore this career. If you’re fresh out of a fashion college, consider interning at a reputed Fashion House to learn the nuances of design. 2. STYLIST– From Editorial Styling to Celebrity Styling, the Styling Career has evolved over time. If you have a keen eye for detail, if you can communicate and understand who your client is and what they want, you should consider getting into Styling. 3. FASHION TECHNOLOGIST – Fashion Technologists work on the creation of Fabrics. They ensure the fabric is made using the most cost effective and efficient methods. Today we see companies coming up with Sustainable and Eco Friendly Fabrics. Students with Science background can opt for this Career. 4. FASHION E-COMMERCE – Coming from a Fashion E-commerce industry, with an experience of almost 6 years now, I can safely say that it’s one of the fastest evolving industries out there. It’s exciting and cut throat at the same time. Today almost every Brand has an e-commerce Website. There are e-business MBA programs. If you have a Fashion & Business Background, you should definitely look at starting an e-commerce website. If that’s not possible financially, you can start with selling your Designs, Merchandise on E-commerce Marketplaces like Amazon, Flipkart etc. Consider interning at an E-commerce Company before starting your own to gain Business experience. 5. LUXURY BRAND MANAGER – Major responsibility of a Luxury Brand Manager is to cater to a Specific Clientele. Understanding Consumer Psychology plays an important role in this career. One must understand the vision of the Luxury Brand and implement Strategies accordingly. 6. FASHION BLOGGER – From Blogging Part-time to taking up Blogging as a Career, Blogging has come a long way. The Popular Content Creators/Bloggers are now known as influencers because of their reach and the impact they have on their audience. They’re now Celebrities & Brands in their own right. One should have a voice because there’s a plethora of Bloggers out there; you don’t want to get lost. 7. DIGITAL MEDIA SPECIALIST – With almost every individual on social media today, companies are hiring professionals to manage and create content for their social media handles. If you love creating content, you should consider this career option. 8. FASHION SHOW PRODUCER – For a 10-15 minutes runway show, the planning and work starts almost a year in advance. A Fashion Show Producer is in charge of every aspect of a Fashion Show. The responsibilities are both creative and business. Scouting Locations, Budgeting, assisting in selecting the designers are some of the aspects. Making decisions quickly and communicating effectively are one of the most important skills for this job. 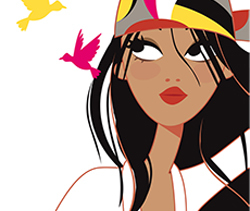 There are many other career opportunities in fashion industry which includes Fashion Illustrator, Fashion Business Management, Fashion Photography, Fashion Retailer, Trend Forecaster, Retail Buyer, Fashion Editor and many more. WHO IS THE FATHER OF FASHION? It’s Charles Frederick Worth…..A fashion designer of note, born on the 13th of October 1825, who founded a leading fashion house in the 19th century called “The House of Worth” in 1958. He began sewing dresses to match the shawls. Initially, these were simple designs, but his skillful tailoring stood out for his clients to notice. Worth transformed the connection between a client and the couturier. Earlier there were seamstresses who would visit the client’s residence for a one-on-one discussion on the client’s design requirements; but with Worth, clients mostlyvisited his store for a consultation, which also became a get-together place for the who’s-who of the society.He was the first to use live models to show his collection to the clients. 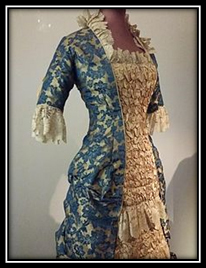 Worth’s garments were well-known for their extravagant textiles and accessories and for including features from historical clothing. Amongst his many significantrevolutions in women’s fashion were to the lineup of dresses and their lengths. 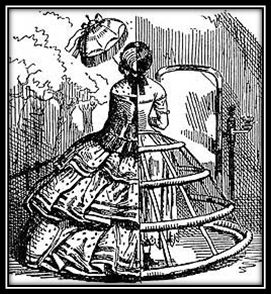 He transformed a very popular trend…….the crinoline. By the way, a crinoline is a structured petticoat designed to hold out a woman’s skirt. Originally, crinoline was a stiff fabric made of horsehair (“crin”) and cotton or linen which was used to make underskirts and as a dress lining. Now because crinoline was ever more huge and bulky in size, it made it hard for women to walk through doors, sit, takecare of their children and even hold hands. Charles Frederick Worth designed a new practical silhouette and thus transformed the crinoline into a narrower piece moving the largest part to the back, hence freeing up the front and sides. His new crinoline was a huge success. 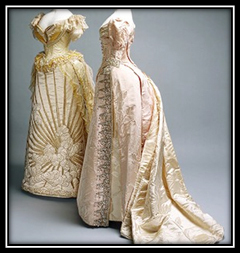 In due course, Worth gave up the crinoline in all, and created a straight gown shape without a defined waistline that we now know as the princess line……”Princess line” describes a woman’s fitted dress or other garment cut in long panels without a horizontal joint or divisionat the waist. 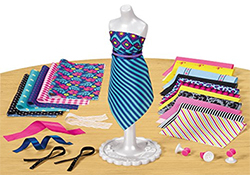 Instead of relying on darts to shape the garment, the fit is achieved with long seams and shaped pattern pieces. FUN FACT: Alternative name for the Princess line was French-dart-line dress. 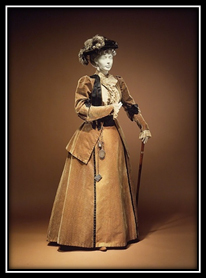 Worth also fashioned a shorter hemline; interestingly this was done at a suggestion of Empress Eugénie who loved long walks and hated long skirts. Thus calling it “A Walking Skirt”. This was primarily seen as very drastic, even scandalous, since it was at ankle length, but it’s practical benefits wereembraced over time. Deepika Butola is an inspiring influencer and a blogger. She always is very fond of creating an attitude of healthy yet stylish life. Deepika has also done a MTV show Dating IN THE DARK’. 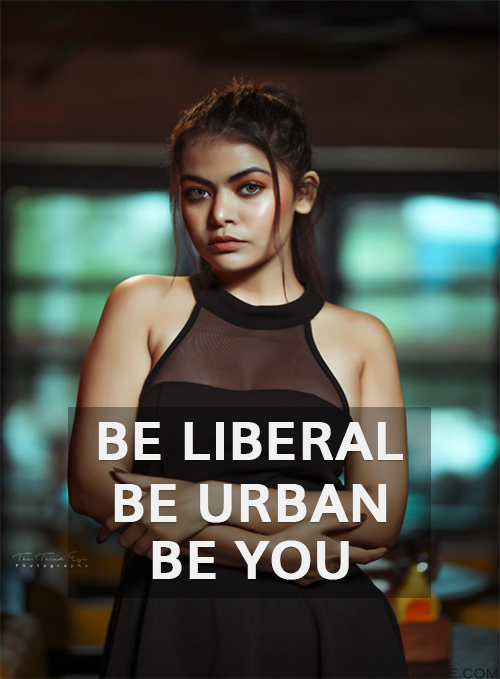 As an influencer, it’s hard to get the right content for the audience is what she thinks which defines her mindset towards the dedication to make people understand the right set of rules in life with a style. Priyanka Chopra as her style icon depicts that Deepika is a liberal yet independent empowered women who believes that style and fashion is a language in itself. We always have our mantras to live our life by creating a statement in mind about who we are and what type of dressing sense belongs to us, defines us. The two brands, Semessta and SSS, are known for the girl boss dressing opinion. Both the brands are emerging and have their own signature thoughts and styles with their own identity. 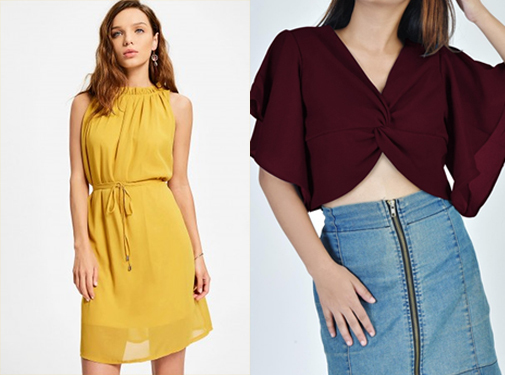 The fun fact is, these brands gives you option to select according to trends and affordability, keeping in mind the enthusiasm of the shopaholics. The brand Semessta is about the modern women which gives access to the international clothing and to celebrate women at their best. Semessta focuses on apparels specific to partywear, beachwear, gymwear and more. 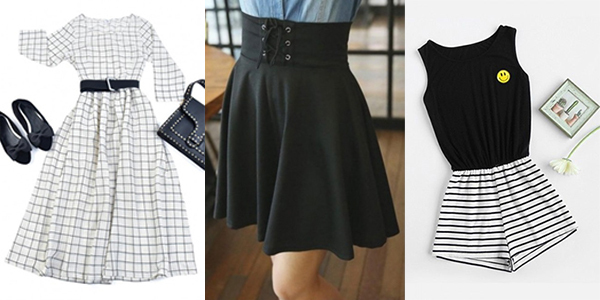 It defines women in an appropriate manner and to rescue them from the outfit of the day situation. We women are at the peak with the independency in this corporate world and as per the fact our dressing defines our personality in which Semessta helps us slay it at it’s very best. On the other side, STREET STYLE STORE has its own definitions towards fashion but with the same intentions to dress the girl boss. They do have men’s collection as well but what they have as their cherry on the cake is that they provides ‘SALE’ for the entire year which makes shopaholics go crazy and get attracted. Discounted prices are their main attraction what they do to make their guests become permanent customers. Moreover, a lot of varieties in clothing, foot wears, accessories makes it much easier to find many things in one area. Street stylers even makes a consumer feel good by providing styling tips in a pictorial form which makes the consumers also choose the ‘already done combo packs’ so that they just have to wear it.